The Birds of Opulence has the sweep of a saga told with the economy of a sonnet. Stretching over the last four decades of the 20th century (1962-1995), the novel follows two families, the Goode-Browns in their sprawling cluttered house where there is “always a cake cooling on the stove and somebody saying something” and the Clarks, mother and daughter, living in self-imposed exile and silence in their small house nearby. It is also the story of Opulence, an African-American town on the edge of the Kentucky Appalachians. At the center of this story are two girls, Yolanda Brown and Mona Clark. The novel opens with their births and chronicles their friendship until they graduate high school and leave Opulence. Each girl’s birth is extraordinary. Yolanda is born in the squash patch on the Goode’s home place farm with her great-grandmother as midwife. Mona’s mother conceives in a trancelike fever dream of mourning and desire for her dead husband. In her sleep, she thought the knock on the door was Sonny coming home from working on the power lines. She opened the door and buried herself into his chest. She doesn’t know that the coupling was real until she goes into labor. 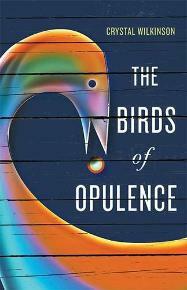 Despite its lyrical minimalism, The Birds of Opulence is a complex book, difficult to summarize. I said the narrative centers on the girls but the structure is more like a Venn diagram, a cluster of overlapping circles with the girls at the intersection. Mama Minnie is a pillar of the church whose tough love won’t keep scandal out of her family. Her daughter Tookie has mysterious scars that sometimes show from under her clothes. “If [Tookie] let herself speak, there’s a lifetime of words that would fall right out, so she doesn’t say much.” Her granddaughter, Lucy, seems to have been driven mad by her squash-patch delivery. She refuses Yolanda, lets her fall in front of the community of women gathered to celebrate the new baby.
. . . the baby rolls from Lucy’s lap, rolls like a can of lard, like a wad of fabric or a cumbersome quilt, like a rolling pin or a small sack of new potatoes, and makes a light thud on the plank floor like something being cast away. Mona’s grandmother had a “nervous breakdown” when Mona’s mother Francine was seven. Francine may not be mentally ill, but she is eccentric enough to scandalize the respectable matrons who disguise their curiosity with gifts and offers of help. Though she carries her newborn like a sack of potatoes and obviously could use some help, she physically evicts these Samaritans and steadfastly refuses to become part of the community. The heart of the novel and its physical center is Dinner on the Grounds, an annual homecoming in the heat of July. Mama Minnie “declares, like she has every year from her front porch, when anyone would listen that Dinner on the Grounds has been going on since slave times.” Dinner on the Grounds is like a day of universal amnesty. These events are observed and judged by “the talk,” the gossiping women of the town who, in a book built around bird imagery, remind me of the Harpies, those Greek birds with women’s faces whose job was to torment human kind. Everybody dresses “to the nines,” everybody gets a hug from somebody and a plate of their favorite dishes from childhood. Even the few white people who come receive food and hugs along with everybody else. And, it is an occasion for flirtations and couplings. Many a marriage has begun at Dinner on the Grounds, and many a union has been broken there too . . . Yolanda and Mona watch it all, and learn their lessons well. The Birds of Opulence is a many layered cake of a book with a narrative strategy somewhat like Faulkner’s As I Lay Dying, wherein many voices speak and each reveals a bit of the story, but without Faulkner’s grotesquerie. It compares well with the lyrical stylings of Zora Neale Hurston’s Their Eyes Were Watching God without the stereotyping and melodrama. It owes a bit to magic realism, especially in Mona’s conception, where not even Francine knows who the father is. These events happen outside national politics in a very troubled time, except that the children begin to sport Afros and the town raises flags for the bicentennial. No one protests, no one is drafted. Like Jane Austen, Wilkinson keeps the focus close in on the two families and on those timeless familial concerns love and death, madness and the human condition. Before I close, I must praise Ron Davis’s dust cover design, which is spectacular, a perfect visual representation of the novel and scrumptious to look at. Crystal Wilkinson also has done the best she can, and it is a spectacular best. Sherry Chandler has published two full-length collections of poetry, Weaving a New Eden (Wind Publications, 2011) and The Woodcarver’s Wife (Wind Publications, 2014). She has received the Betty Gabehart Award for poetry, the Editor's Choice award for the premier issue of Waypoints, and three nominations for a Pushcart Prize. She has received financial support from the Kentucky Arts Council and the Kentucky Foundation for Women. Her most recent work has appeared in Pine Mountain Sand & Gravel, The Louisville Review, and Kestrel.